There is a cake on top of a plate. There is a small candle one inch in the cake. A small cherry is two inches to the left of the candle. A small cherry is two inches in front of the candle. The cherry is facing right. A small cherry is two inches behind the candle. The cherry is facing left. A small cherry is two inches to the right of the candle. The cherry is facing backward. There is a [concrete] wall one foot behind the cake. 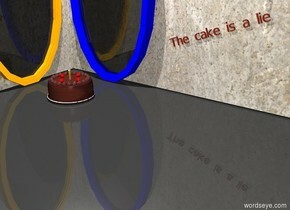 There is very tiny mahogany "The cake is a lie" in front of the wall. It is leaning 20 degrees to the right. It is one foot to the right of the cake.. It is one foot above the ground. There is a blue portal in front of the wall. There is another [concrete] wall one foot to the left of the cake. The wall is facing the cake. There is an orange portal ten inches to the left of the cake. The portal is facing right. The ground is dark. The sky is white. There is a white light four feet above the cake.